As you know, the Russian city of Sochi is the host of the Winter Olympics since Friday. According to a brand new study, this might be the right time as it is most probable the city won’t be able to do so in the future because of climate change. 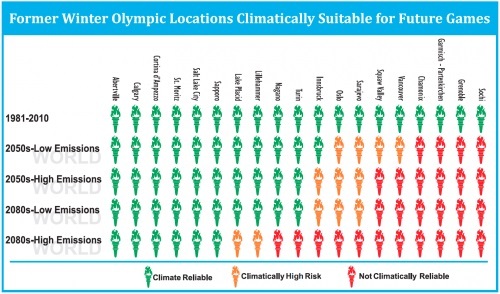 Even artificial snow making won’t be enough to provide snow for Winter Olympics by mid-century if rising temperatures were to continue unabated. For more on this particular study, please check out their full report. I already noted here that climate change was endangering many of the things we loved – tea, chocolate, coffee, wine… the list does go on. Perhaps it’s more than high time to do something big about it, isn’t it ?